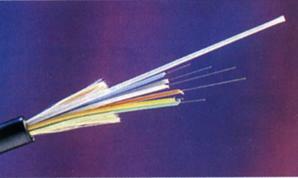 Some communication systems require tens or even hundreds of fibers (such as a metro backbone system). Put fibers in a cable make it very easy to install and maintain. Fiber optic cables have to be pulled into place through ducts (outdoor) or conduits (indoor). Pulling eyes are attached to the strength members or cable outer jackets. This is critical for isolating the fibers from the applied pulling forces. Glass fibers cannot endure more than 0.1% to 0.2% elongation during installation. Cable structures protect fibers from moisture (outdoor cables), extreme temperature (aerial cables) and influx of hydrogen into the fiber (which causes light absorption peak at 1380nm which in turn impair fibers’ transmission properties). 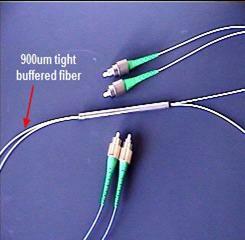 Based upon fiber types in a cable, fiber optic cables can be categorized as three types. All fibers in the cable are single mode fibers. All fibers in the cable are multimode cables. Both single mode and multimode fibers are packaged in one cable, such as 4 multimode fibers and 4 single mode fibers in a single cable. 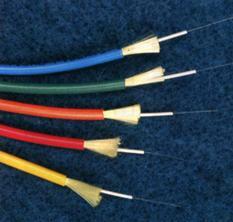 For data center premise cables, the jacket color depends on the fiber type in the cable. 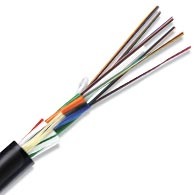 For cables containing single mode fibers, the jacket color is typically yellow, whereas for cables containing multimode fibers, the jacket color is typically orange. For outside plant cables, the standard jacket color is typically black. The construction design and choices of materials are vital in determining characteristics of a cable. The design factors for some types of fiber optic cables are listed below. Indoor cables: Fire safety is the number one factor in selecting indoor cables, particularly those that run through plenum spaces. Indoor cables must pass the flame-retardant and smoke-inhibitor ratings specified by NEC. Outdoor cables: Moisture resistance and temperature tolerance are the major factors when choosing materials for outdoor environment cables. They also need to be ultraviolet (UV) resistant. Aerial/Figure 8 Self-Supporting Cables: Aerial cables must endure extreme temperature ranges from sunlight heat to freezing snow. They also must survive high wind loading. Polyethylene (PE). PE (black color) is the standard jacket material for outdoor fiber optic cables. PE has excellent moisture – and weather-resistance properties. It has very stable dielectric properties over a wide temperature range. It is also abrasion-resistant. Polyvinyl Chloride (PVC). PVC is the most common material for indoor cables, however it can also be used for outdoor cables. It is flexible and fire-retardant. PVC is more expensive than PE. Polyvinyl difluoride (PVDF). PVDF is used for plenum cables because it has better fire-retardant properties than PE and produces little smoke. Low Smoke Zero Halogen (LSZH) plastics. LSZH plastics are used for a special kind of cable called LSZH cables. They produce little smoke and no toxic halogen compounds. But they are the most expensive jacket material. Aramid yarn is a yellow color, fiber looking material. 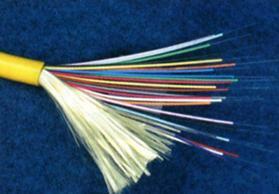 It is strong and is used to bundle and protect the loose tubes or fibers in the cable. It is the strength member to provide tensile strength along the length of the cable during and after installation. 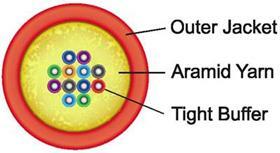 When a cable is pulled into a duct, the tension is applied to the aramid yarn instead of the fibers. 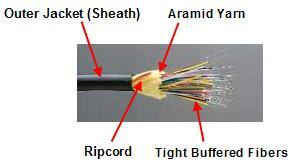 Many fiber optic cables has a central strength member, made of steel, fiberglass or aramid yarn. Central strength members are needed to provide the rigidity to keep the cable from buckling. 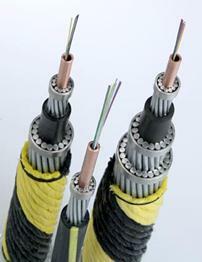 Central strength members are common in outdoor cables and some high fiber counts indoor cables. Gel compound fills buffer tubes and cable interiors, making the cable impervious to water. It needs to be completely cleaned off when the cable end is stripped for termination. Ripcord is a thin but very strong thread embedded just below the cable jacket. Its role is to split the cable easily without harming cable interiors. Fiber optic cable are available in a wide variety of physical constructions. Fiber cables can be anything from simple simplex or duplex (zipcord) cables used for jumpers to 144-fiber cable for intercity transmission. 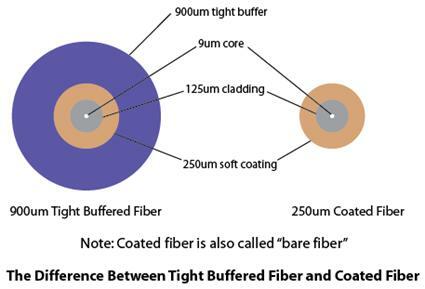 However most of the fibers used in these cables come down to two basic configurations – 900um tight buffered fibers or 250um coated fibers (also called bare fibers). Actually tight buffered fibers cover a coated fiber(the coating is soft plastic) with a thick layer of harder plastic, making it easier to handle and providing physical protection. Based on 900um tight buffered fiber and 250um coated fiber there are two basic types of fiber optic cable constructions – Tight Buffered Cable and Loose Tube Cable. Multiple color coded 900um tight buffered fibers can be packed tightly together in a compact cable structure, an approach widely used indoors, these cables are called tight buffered cables. Tight buffered cables are used to connect outside plant cables to terminal equipment, and also for linking various devices in a premises network. Multi-fiber, tight buffered cables often are used for intra-building, risers, general building and plenum applications. Tight buffered cables are mostly built for indoor applications, although some tight buffered cables have been built for outdoor applications too. On the other hand multiple (up to 12) 250um coated fibers (bare fibers) can be put inside a color coded, flexible plastic tube, which usually is filled with a gel compound that prevents moisture from seeping through the hollow tube. Buffer tubes are stranded around a dielectric or steel central member. Aramid yarn are used as primary strength member. Then an outer polyethylene jacket is extruded over the core. These cables are called loose tube cables. Loose tube structure isolates the fibers from the cable structure. This is a big advantage in handling thermal and other stresses encountered outdoors, which is why most loose tube fiber optic cables are built for outdoor applications. 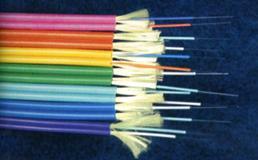 One or more loose tubes holding 250um bare fibers. Loose tubes strand around the central strength member. Per National Electrical Code (NEC) requirements all indoor fiber optic cables must be marked and installed properly for its intended use. There are three types of indoor spaces identified by NEC: plenums, risers and general purpose areas. What is a plenum area and plenum rated fiber optic cable? Plenum is an air-handling, air flowing and air distribution system space such as that found above drop ceiling tiles or heating and ventilation ducts. Plenum rated cables must meet UL-910 specification and their outer jacket are made of materials that retard the spread of flame, produce little smoke and protect electronic equipment from damage in fires. Plenum cables can be run through plenum spaces without special conduits. Plenum rated cables are more expensive, because of the jacket material, but the added safety and extra conduit cost savings (if using riser rated cables) pays that back. What is a riser are and riser rated fiber optic cable? Riser is a pathway such as floor opening, shaft or duct that runs vertically through floors. Riser rated cables can be run through building vertical shafts (risers) or from one floor to another floor. Riser rated cables must meet UL-1666 fire-resistance specification and cannot be installed in plenum area. However plenum rated cables can be used as a substitute for it and installed in riser spaces. What is a general purpose area? Any space on the same floor which is not plenum or rise is identified as general purpose area. Per NEC code outdoor cables and unmarked cables can be installed indoors but they have to be completely installed in metal conduit or electrical metallic tubing. 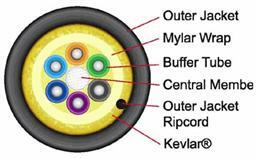 Based on NEC code, indoor fiber optic cables can be categorized as six types. You can see their designation and respective UL test below. 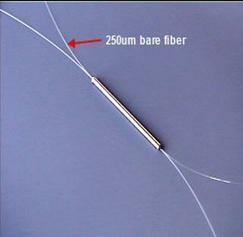 A single cable structure with a single fiber. 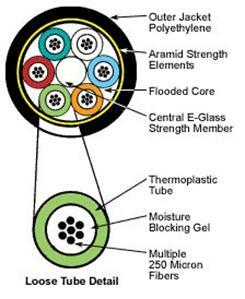 Simplex cable varieties include 1.6mm & 3mm jacket sizes. Duplex-zip. This cable contains two optical fibers in a single cable structure. Light is not coupled between the two fibers; typically one fiber is used to transmit signals in one direction and the other receives. This compact building cable consists of individual 900µm buffered fiber, is smaller in size and costs less than breakout cable. Connectors may be installed directly on 900µm buffered fiber at breakout box location. Breakout cables are also called fanout cables. In tight buffered cables each fiber is only a 900um tight buffered fiber, but in breakout cables every fiber is a subcable by itself. 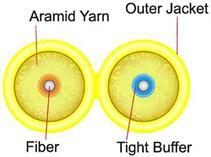 Each fiber has a 2~3mm jacket, then outer jacket covers these subcables, aramid yarn and ripcord inside. This design allows users to divide the cable to serve users with individual fibers, without the need for patch panel. Breakout cable enables the quick installation of connectors onto 2+mm robust jacketed fiber. Consists of up to 12 fibers contained side by side within a single jacket. Often used for network applications and data centers. Low Smoke Zero Halogen cables are offered as an alternative for halogen-free applications. Less toxic and slower to ignite, they are a good choice for many internal installations. They are available as simplex, duplex and 1.6mm designs. This cable may be run through risers directly to a convenient network or splicing closet for interconnection. Indoor/outdoor rated tight buffered cables have riser and plenum rated versions. These cables are flexible, easy to handle and simple to install. Since they do not use gel, the connectors can be terminated directly onto the 900um fiber without difficult-to-use kits. This provides an easy and overall less expensive installation. Tube encloses multiple coated fibers that are surrounded by a gel compound that protects the cable from moisture in outside environments. Cable is restricted from indoor use, typically allowing entry not to exceed 50 feet. This cable is suitable for both indoor and outdoor applications. One advantage of this cable is that it eliminates the need for a splice or connector at the point where the cable transitions between an outdoor and indoor environment. Figure 8 (aerial/self-supporting) fiber cables are designed to be strung from poles outdoors and most can also be installed in underground ducts. They have internal stress members of steel of steel or aramid yarn that protect fibers from stress. Aerial cable provides ease of installation and reduces time and cost. Figure 8 cable can easily be separated between the fiber and the messenger. Temperature range -55 to +85°C. Armored cables are similar to outdoor cables but include an outer armor layer for mechanical protection and to prevent damage. They can be installed in ducts or aerially, or directly buried underground. Armor is surrounded by a polyethylene jacket. Armored cable can be used for rodent protection in direct burial if required. This cable is non-gel filled and can also be used in aerial applications. The armor can be removed leaving the inner cable suitable for any indoor/outdoor use. Temperature rating -40 to +85°C. Submarine cables are used in fresh or salt water. To protect them from damage by fishing trawlers and boat anchors they have elaborately designed structures and armors. Long distance submarine cables are especially complex designed.